Wario Land: Shake It! has approximately 180,674 U.S. Wii owners that reported gameplay data for the game, with over 4 years of data possibly reported. Players have reported 1,980,903 Total Hours of gameplay since the game released, with the total average play-time being 10 Hours 58 Minutes "Per person" and the average play-time per day/session being about 1 Hour 35 Minutes. Was Wario's return to console platforming, after more than a half-decade absence, received well by critics and customers? The game has a "professional" critic review score average of 77.70%, based on 43 reviews on GameRankings.com. The customer review score average for Wario Land: Shake It! is 81.87%, based on 64 reviews from Amazon.com. I played Wario Land: Shake It! very briefly on a Game Stop store demo, but I didn't spend very much time on the demo before moving on. If you have never seen what type of gameplay you can expect from Wario Land: Shake It!, the trailer below should give you a good idea of what you can expect from the game. 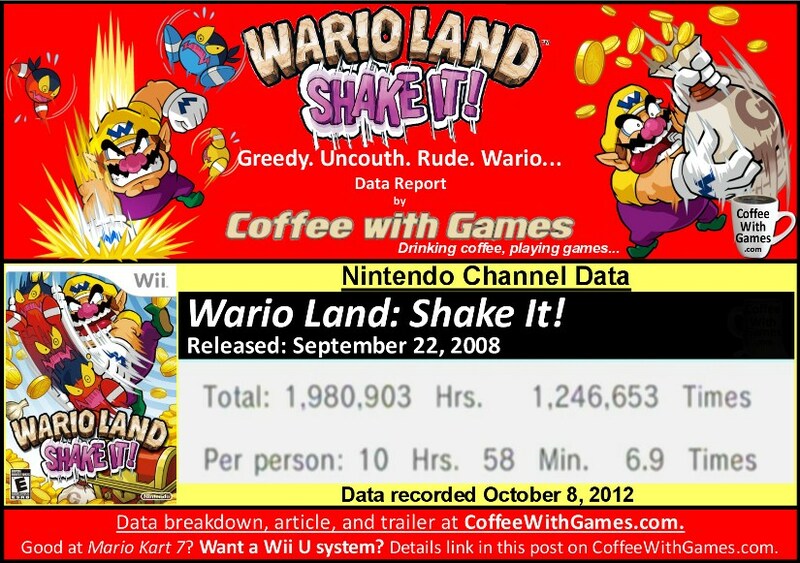 I think based on the average hours reported "Per person" that Wario Land: Shake It! would be a good choice for a Nintendo Selects title, but being that it hasn't happened yet, and with the Wii U releasing in just over a month, I don't think Nintendo is going to do much with the Wii anymore. Perhaps we can hope that Nintendo will add Wii titles to the Wii U's eShop? I hope so, and not just for Wario Land: Shake It!, but also for Wii games like Pandora's Tower that never released for North American Wii owners. Did any of you play (and beat) Wario Land: Shake It!, and if so, how many hours did you get out of it? Is it a one-time play-through and then not much to go back and play again, as the reported average here might suggest? If you have played Wario Land: Shake It!, do you think it would be a good choice for a Nintendo Selects title, and/or a possible Wii U eShop game in the future? I'd love to see this as a selects title and would probably pick it up, naturally to not complete, before many of the others. "I'd love to see this as a selects title and would probably pick it up, naturally to not complete, before many of the others." Haha! Of course, perhaps you can complete a level or two, to add it to your "Incomplete BUT Played..." list? I think the Wii would have done A LOT better had Nintendo not been greedy (like Wario perhaps? ), and introduced a budget line of games A LOT earlier, and how about them including 3rd Party titles in it as well like other consoles? $20 budget games = great birthday, Christmas, good report card, anniversary, etc., type gifts. I didn’t purchase the game, I only rented it. liked it, I just needed more content to justify the price. "Money’s tight for me (for whom is it not?)" Can definitely understand that. I'm trying to spend bday money the right way, and budget/prioritize game buys, OR console buys right now. Being that Wario Land isn't being published/shipped anymore for the Wii, and it's not a Nintendo Selects title, the best way to find it right now is used. You can find it for $15 or less now, on various sites. I'm with you on the budget titles. That's cool that they threw in Pikmin 2, but that's a small bone way too late. Yeah, Pikmin 2, a GameCube game. o_0 I understand they added new controls, but other than that, nothing else? It's like they waited until the Wii was OFF the cliff before trying to put the brakes on. Alright, thanks to you Mr. Coffee I watched the Video Review of this game and now I want it! I found it used at Gamestop for only $12.99. I think I can justify this purchase sometime in the near future, or just ask for it as a Christmas present.